At Australian 4x4 Tag Along Tours our trips are organised and led by the owner of the business, John Cantrell, who has decades of 4wd driving experience both in Australia and overseas, and sometimes in extremely remote areas, and he is there to look after your very best interests, to ensure that you have a great holiday, traveling to some fantastic Australian, and often iconic, destinations in a relaxed and safe atmosphere without a whole lot of rules and regulations. 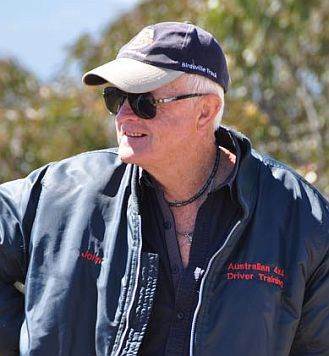 John is one of New South Wales leading, Nationally Accredited, 4wd driver trainers, so help and advice will happily be given if you are not too experienced and not quite sure how to tackle things properley, as well as being one of the most experienced tour operators in the North Simpson Desert and Victorian High Country. Australian 4x4 Travel is an Australian Tourism Accredited and an Australian Tourism Quality Assured Business as well as being Eco Tourism Certified, and the Australian 4x4 Tag Along Tours side of it runs 4wd tag along tours ranging from four days to fifteen days, our aim is to take you to special places, show you more and give you better value than you will find elsewhere. For the full trip information on the trips click on the links above. 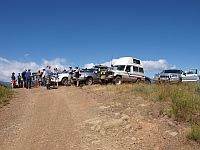 Australian 4x4 Tag Along Tours are easy going and without much of the formality and regulation often found on commercially operated 4wd tag alongs. We want you to relax, meet like minded people, and have a great time, as well as being able to visit and experience some of Australia's best, and often most spectacular, places. Our main trips are to the Victorian High Country for 5 and an amazing combined Outback, Simpson Desert, North Simson Desert and Hay River (12 days) or Madigan Line (14 days) trip, including visits to many iconic Outback destinations in NSW, South Australia, Northern Territory and Queensland. 12 day Outback, Simpson, North Simpson and Hay River 4wd Tag Along Tour is almost certainly going to give you the best value tag along you are likely to find for that region. No 4wd driving experience is required as we will help you along the way if needed. Why do what everyone else does and simply cross the Simpson from west to east - be different, this trip incorporates so, so much more. You will have visits to and stop overs in many of the iconic outback towns of New South Wales, Queensland, South Australia and the Northern Territory. Starting at Marree the trip takes us via Alice Springs through many Outback towns, the Simpson, North Simpson, Hay River, Birdsville and much more. This trip has to be the best value Outback / Desert trip in Australia at the moment and you can be part of it, don't settle for less. Australian 4x4 Tag Along Tours Victorian High Country 4wd Tag Along Tour takes you to where the scenery is absolutely stunning, the countryside is pristine and the tracks excellent to drive with a mix of easier to harder. Four, five or six day camping trips and some 4wd driving experience would be helpful although we can help if if needed. 14 day Madigan Line, Simpson Desert and Outback 4wd tag along tour takes us through 4 states, visiting several iconic destinations along the way, and then across the Simpson Desert using the very remote Madigan Line and through Adria Downs Station to Eyre Creek, Big Red and Birdsville. The trip starts in Marree in Outback South Australia and ends at White Cliffs in Outback New South Wales. We follow the route taken by Cecil Madigan across the northern end of the Simpson Desert in 1939 using camels for transport. 5 day Victorian High Country. The Victorian High Country 4wd Tag Along run by Australian 4x4 Tag Along Tours will take you to places that are iconic, much talked about and on the "to do" list of 4wd drive drivers Australia wide, but we will also take you on some not so traveled tracks and into a reasonably remote area with absolutely amazing scenery and steep but good driving. 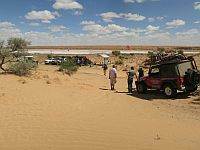 We camp at the same camp site for the full duration of the trip so we are not continuously packing up camp every morning and putting it all up again at night, as is often the case on these sort of 4wd tag along tours. Your trip leader, John Cantrell, knows this area well, which places to see and which tracks are worth driving.